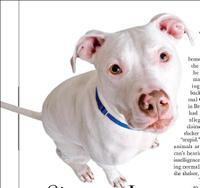 So I was reading my May issue of Ladie's Home Journal (don't ask) last week and came across this story about a deaf albino American Pit Bull Terrier named Duncan. Duncan was rescued from a drug house, nearly put to death, and saved by Hot Water Animal Rescue. He was later fostered and then adopted by Sabrina Brini. Sabrina taught Duncan ASL -- and he knows over 50 signs. It's a cute story, and worth the read. I've posted the whole story over at the KCDA Site -- it's called Signs of Love. It's great that the 4 million readers of Ladie's Home Journal will get a chance to see the story. Have a great weekend. And if you don't have plans tonight, come join us out in Lee's Summit for our Draws For Paws event. Well, there are a couple of "wins" in the area recently as last week, Peculiar, MO passed their new breed-neutral dangerous dog ordinance. I've only seen a draft of the final ordinance -- but there were some really interesting (good) elements in the draft I saw that I will point out if I can ever get my hands on the final ordinance. Peculiar came a long way from their original proposal that declared 6 breeds of dogs as dangerous (and a curious selection of six breeds). So congrats to them for working with the animal welfare community in coming up with a great, fair law. Meanwhile, Warrensburg, MO just had the first reading of their ordinance last night, and it also appears as if it will be a solid breed-neutral law. It's actually amazing that Warrensburg, MO, the home of the phrase "A man's best friend is a dog", spent so much time contemplating potentially banning some of man's best friends. Yes, this was news to me, even though I've lived near Warrensburg my entire life, that it was the home to this popular phrase. 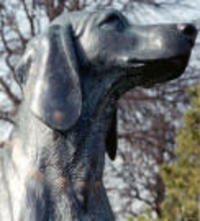 But the story comes from "eulogy of the dog" that was in honor of a man's dog, Old Drum (a statue of Old Drum stands in the town). You can read the entire story and eulogy here. And congrats to Warrensburg for not making a mockery of their claim to fame.